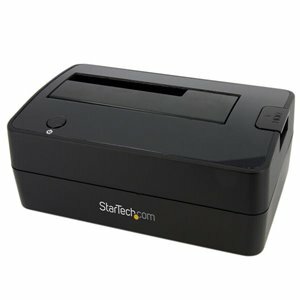 The SATDOCKU3S USB 3.0 Hard Drive Docking Station delivers full, instant access to any 2.5in or 3.5in SATA hard drive, without having to mount the drive in a computer or install it in an external enclosure.Connected to the host computer through a single USB 3.0 SuperSpeed or USB 2.0 connection, the hard drive docking station provides a convenient, plug-and-play storage solution that delivers instant access to the hard drive without requiring a reboot.Relying on the outstanding data throughput support of USB 3.0, the HDD docking station is capable of transfer speed up 5Gbps, making it the fastest way to access data from an external drive. The SATDOCKU3S USB 3.0 Hard Drive Docking Station delivers full, instant access to any 2.5in or 3.5in SATA (SATA, SATA II, SATA III) hard drive (HDD) or solid state drive (SSD), without having to mount the drive in a computer or install it in an external enclosure. Large capacity drives (tested with up to 4TB 3.5" and 1TB 2.5" drives) can be used to greatly enhance your computer's storage/backup capabilities. To ensure compatibility with your computer system, the SATDOCKU3S supports all of the leading operating systems, including: Microsoft Windows® (8/7/Vista/XP/Server 2008/Server 2003), Apple® OSX (10.9/10.8/10.7/10.6), Linux, and Google Chrome OS™.